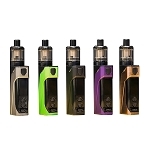 The latest offering by well-known vape brand KangerTech is the iKen Box Mod! KangerTech is a well-known brand in vaping circles supplying a large variety of vaping mods, tanks, coils, and other vaping accessories. If youï¾’re thinking of upgrading your box mod, and havenï¾’t tried KangerTech before, then why not give the KangerTech iKen Box Mod a vape! The KangerTech iKen Box Mod features a massive 5100 mAh internal battery perfect for vapers that need to vape all day long. The KangerTech iKen Box Mod also has a huge 230-Watt power output and long lasting standby capacity. More vapor production, intense flavor, and longer vaping hours give the KangerTech iKen Box Mod a big jump on any of its competition. It doesnï¾’t matter what youï¾’re vaping now, the KangerTech iKen Box Mod with its massive 230 Watts of raw power will blow you away and some massive clouds at the same time! With its 1.54 Inch TFT display screen, the KangerTech iKen Box Mod will clearly display all your favorite vaping parameters. Stylish curves and a modern look give the KangerTech iKen Box Mod an impressive look and comfortable feel. 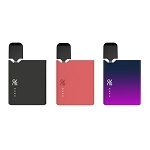 There is also an option with the KangerTech iKen Box Mod to customize the display screen and personalize it with your own distinct style and flair. 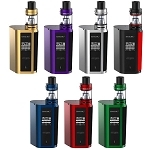 With five awesome colors to choose from, the KangerTech iKen Box Mod takes vaping to an impressive new level!